The second book in the series is called “A New Life”. 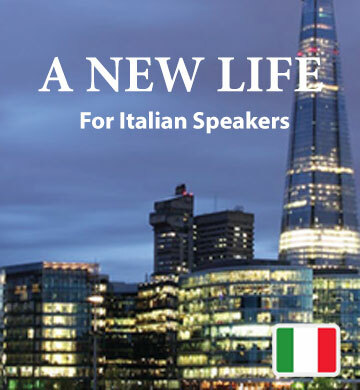 Italian speakers who download this book and audio track will hear the story of a young couple who make the decision to leave behind everything they know in order to embark on a new career in England. The trials and triumphs of their adventure are a joy to read, and in each chapter you’ll learn new vocabulary right along with the heroes. This book gives you a chance to encounter realistic English usage. You’ll hear each word in its natural context, giving you a strong, unconscious familiarity with pronunciation and grammar. This download includes the Easilang app, which makes it possible for you to read and listen on the go, using your smartphone or tablet.